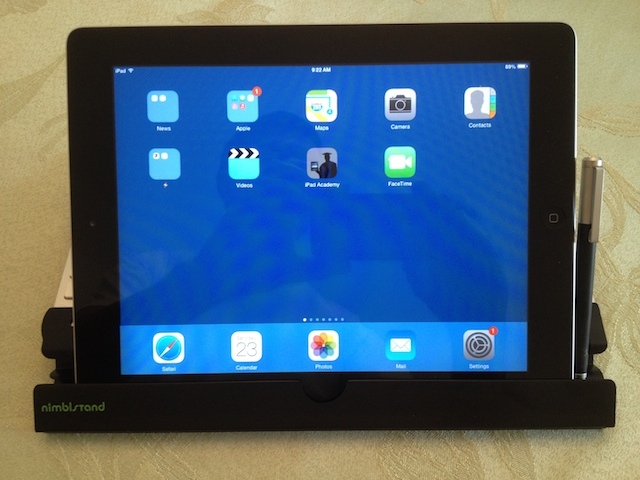 A short time ago, I received a clever stand for the iPad called the nimblstand. 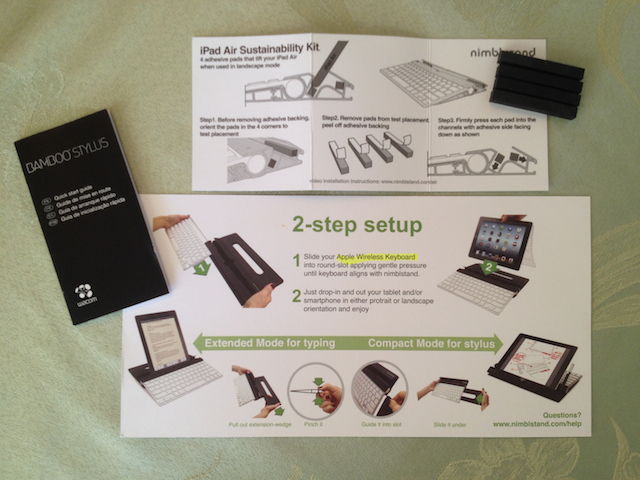 The two-part nimblstand clips to the Apple wireless Bluetooth keyboard, forming a stable stand for typing. You can also reverse the stand for drawing by stowing the stability clip under the keyboard in easel mode. More on this later in the article. Matt Esecson, the company’s cofounder, sent me an evaluation unit along with a letter extolling the virtues of his product. I followed up with a few questions to learn more about how his nimblstand differed from competing products. Matt sent a quick, courteous and informative reply. Here’s my analysis of his claims (edited for this article). I checked every iPad model from generation one to iPad Air. (Yes, I have them all. 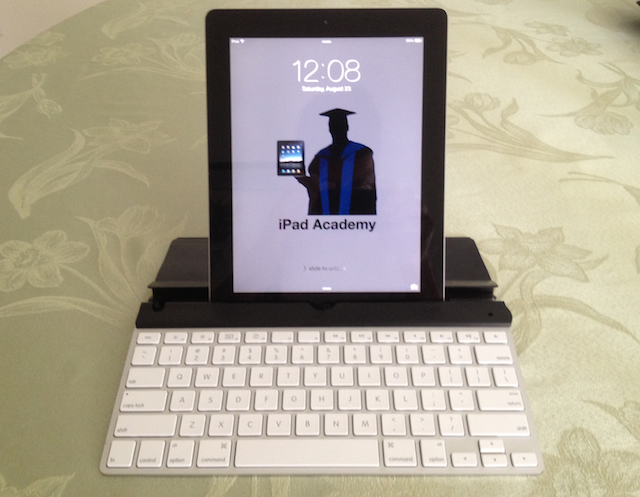 I do run a company called iPad Academy). 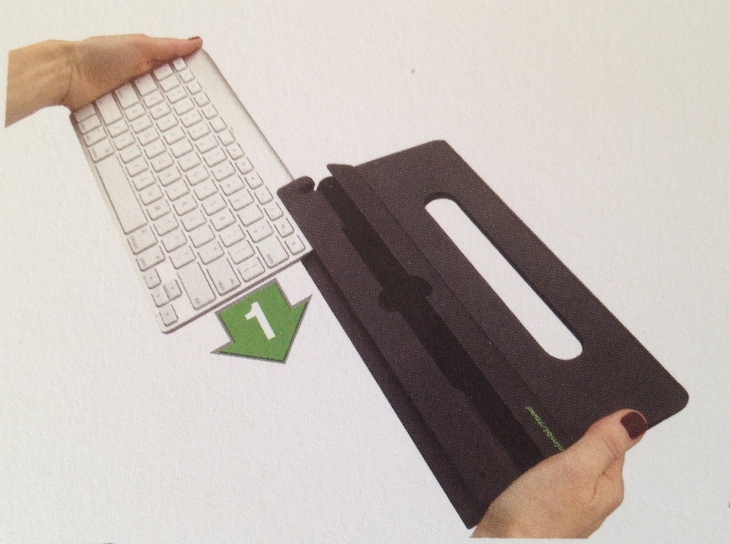 For a proper fit with the iPad Air, you’ll need to add four small pads (to the stand) included in the “iPad Air Sustainability Kit” found in the box. iPad models with the Smart Cover or Smart Case will fit fine. If you have a thicker cover, you’ll need to remove the iPad from its case. 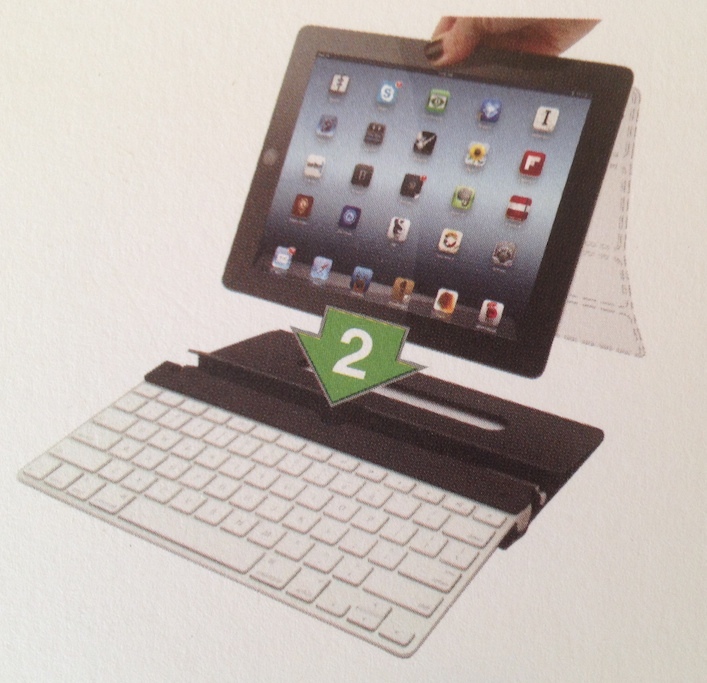 For example, iPads with a folio style cover won’t fit the stand. Lightweight but not flimsy. Traveling with this stand won’t be a burden in your bag. Stability – Other stands may work well on a flat surface such as a desktop or tray table. 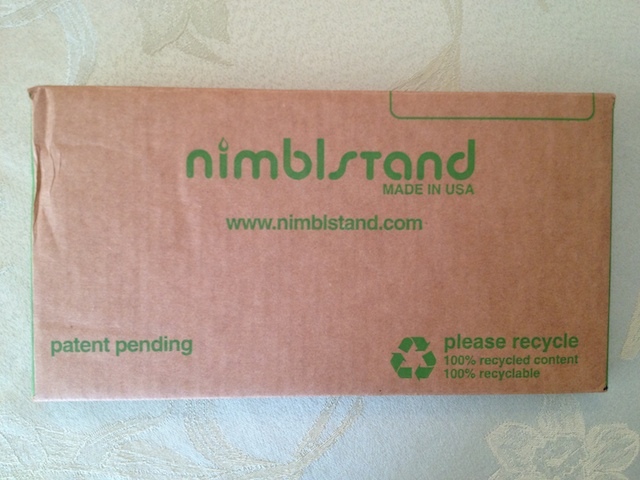 The nimblstand excels on your lap, on a couch or in bed. I like my incase Origami Workstation, another stand designed for the iPad and Apple wireless keyboard. However, the Origami is best used on a flat surface. You can’t balance the Origami on your lap like you can the nimblstand. Our design is all about delivering the best content creation tools in an ergonomic, 2 position easel stand. We believe in the ‘best-in-class’ Apple Wireless Keyboard, but we believe in providing the functionality of a pen for the tablet by designing nimblstand around the integration of a similarly ‘best-in-class’ Wacom bamboo stylus. nimblstand offers a stylus storage slot, so the bamboo has a home and doesn’t get lost. There’s an in-use inkwell in the easel mode to give you a handy location to rest the stylus. The stand easily and quickly converts to an easel mode and Wacom Bamboo stylus is a quality product. The storage slot ensures the stylus doesn’t get misplaced when not in use and the “inkwell” feature keeps the stylus within easy reach when you need it. 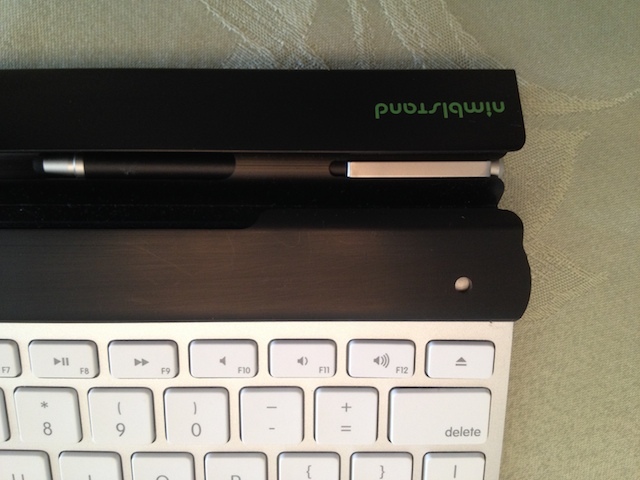 If you already own a stylus you like, you can order the nimblstand without one. The combination stand and stylus is a good value though. You get clear instructions for use of the stand and included accessories. Made in the USA, the product is produced in a factory in Pennsylvania, cut and finished in a sister plant in New Jersey and packaged in a recyclable cardboard box manufactured in Illinois. You can learn much more about the nimblstand at the nimblstand website.